Moreno's segment on the Cooking Channel! MAKE A RESERVATION THRU THE RED “RESERVE NOW” BUTTON ABOVE. 2 farm fresh eggs with USDA steak served with choice of breakfast side above. Consuming raw or undercooked meats, poultry and eggs may increase your risk of food borne illness, especially if you have a certain medical condition. PLEASE NOTE* 18% SERVICE CHARGE IS ADDED TO EACH BILL. Ham, mojo slow roasted pork, Swiss cheese, Moreno's sauce & pickles (or mustard). USDA steak, grilled onions, roasted tomatoes, swiss cheese & Moreno's signature sauce. Chicken, onions, peppers, tomatoes, olives, garlic and spices in a rich stew of beer and white wine, served with Cuban bread for dipping! 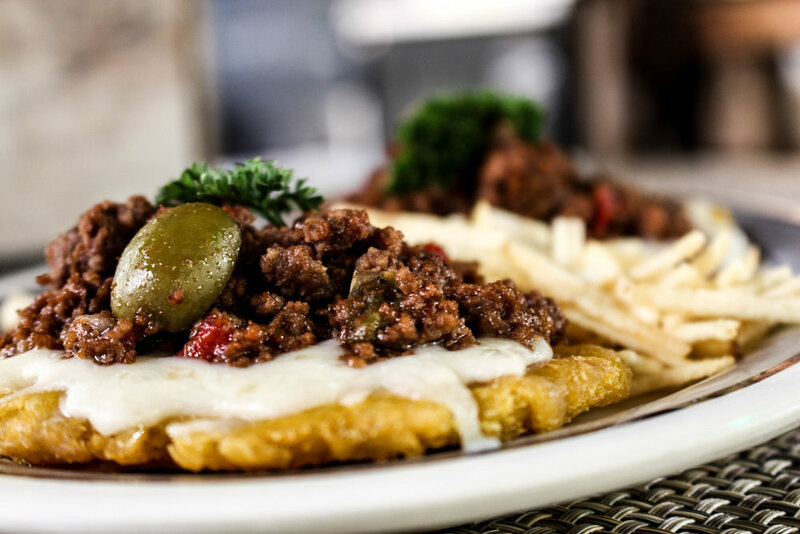 Ultimate Cuban comfort food cooked in the traditional pre-revolution way! Ground beef with raisins, capers, black olives and potatoes. Shrimp sautéed with garlic & olive oil, served with malanga puree, side salad & sweet plantains. Simple and delicious! ask server for more choices we may have. Moreno’s Cuba is a vintage Cuba eatery located at the Dorchester Hotel. Created by the Latin Grammy award-winning Cuban American singer, Jorge Moreno. The restaurant’s concept has been developed around an authentic Havana speakeasy Moreno’s grand uncle, “Jorge Sanchez Villar” owned during the Cuban revolution. 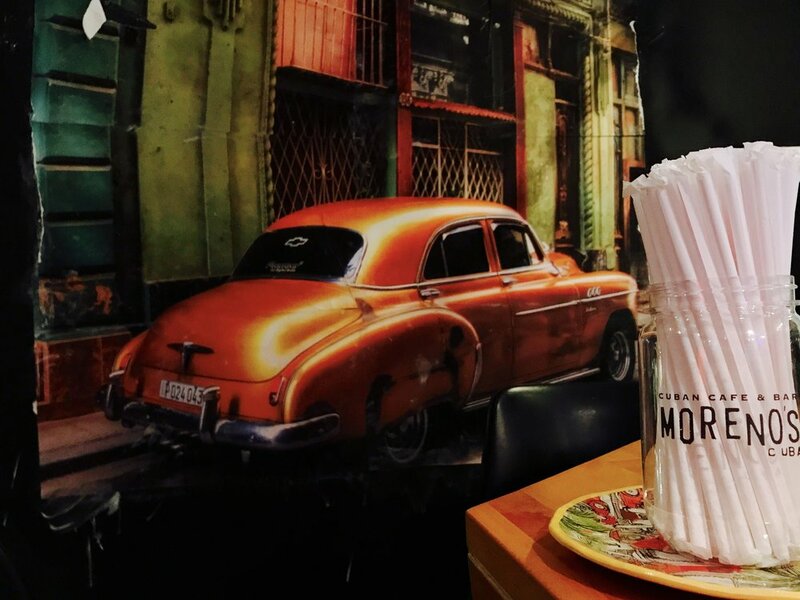 The service and food concept comes from Moreno's grandfather "Antonio Moreno" who ran Cuba's premiere restaurant in the famous “Hotel Nacional” in Havana. Jorge Moreno describes it is an homage to the stories, music, decor and tastes passed down from his family plus his own, being born and raised in Miami's melting pot. 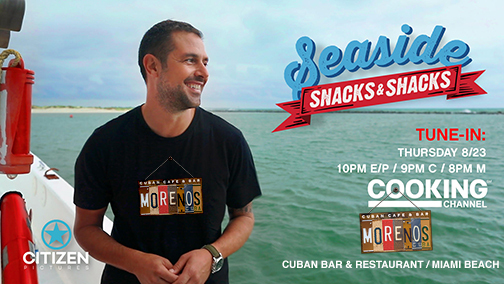 Watch Moreno’s Cuba on the Cooking Channel by clicking here! Reservations required for parties of 5 or more. © 2014-2019 Moreno's Cuba. All Rights Reserved.